KittysVintageKitsch: Fresh Finds & New Faves....All For Me! Fresh Finds & New Faves....All For Me! The title pretty much sums it up....this is what I have acquired for myself over the past few weeks. Meet my glorious new light fitting! 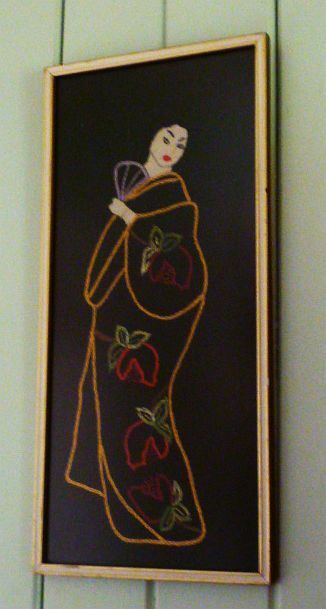 It's mine by default, and free; it was intended for the shop, being a glorious 60s original glass-panelled beauty...unfortunately one of the panels smashed in transit, so I get to keep it, yay! I've had it sitting around for a couple of months but finally fixed it; as usual, anything for myself takes a while to get fixed. Please excuse the fuzzy pic, I couldn't keep my hands still enough with the camera at such a height. Retro print, many of you will recognise this one. I like the fact that it has some colour loss around the edges, I think it adds to the rustic theme. 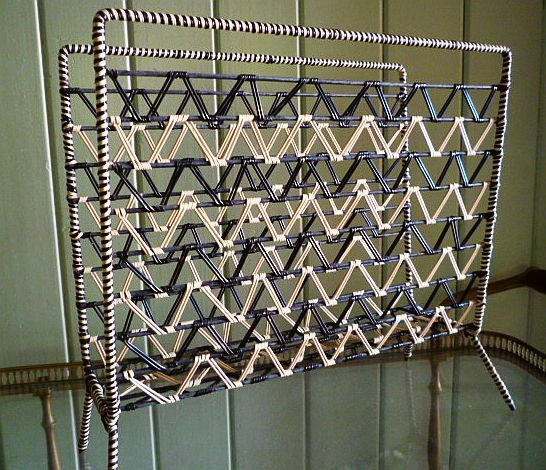 Awesome 50s magazine rack, in excellent condition, just needs white ball feet if I can find them. it fits in with my taste for black and white stuff too, yay! I bought these at my local flea market from a lady whose mother had made them, she had tears in her eyes as I walked away with them, but she was glad they were going to someone who will look after and appreciate them. 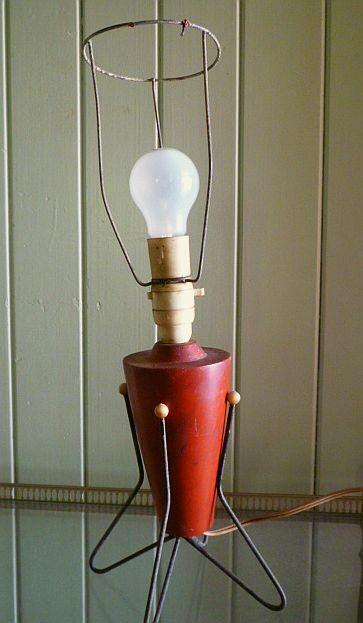 I know this needs a shade and quite a bit of work, but to me this is a fabulous atomic lamp! The red part simply slides out of the base, so I can repaint the whole thing a different colour...which I'll do when I decide what colour I want it to be. Lastly, a saucer or coolie chair, child-sized and of course perfect for VB! As you can see it's already in the lounge room, adding to the 50s look I'm slowly creating. Yes, slowly....but I'll get there one day! What 50s beauties have you bought lately?? I love that coolie chair I want an adult sized one! I like the atomic lamp too. the light fixture is something else! bet it gives a lovely warm glow. The chair is so bright and cheery but that light fixture is a crowning glory. Bet it really does shine when the light is on. I missed out on a adult sized green collie chair last week (that was my Other thing that got away)was only by minutes too it was just $10 so would have grabbed it othewise. 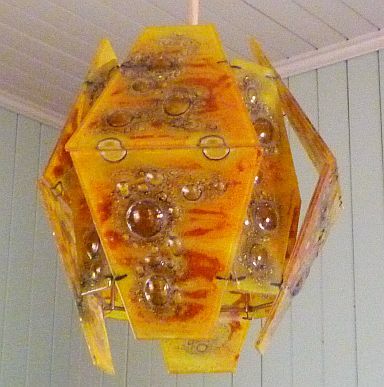 what a unique 60's light fixture. love how it shines. love the 50's salt and pepper shakers and cool magazine rack. 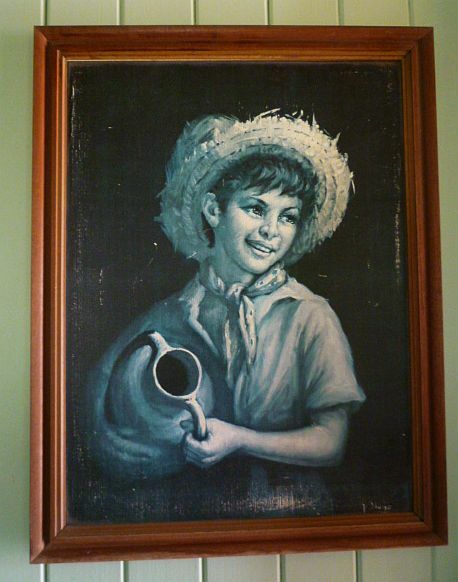 the boy on the painting looks Mexi. Aww I would never sell something my Mama maded or owned. beautiful embrodery though. cant wait to see what you do with the atomic lamo. VB will be so proud watching her cartoons on that lovley saucer chair. 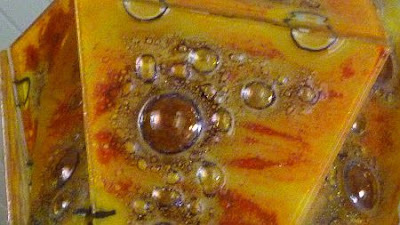 yes, these photos are for her stall and the next skull necklace is for her website Halloween edition. I love the lamp. The colour of the glass is amazing. That pendant light is just gorgeous. I wish we didn't have such high ceilings as the mad fifties fittings I occasionally find just look lost. 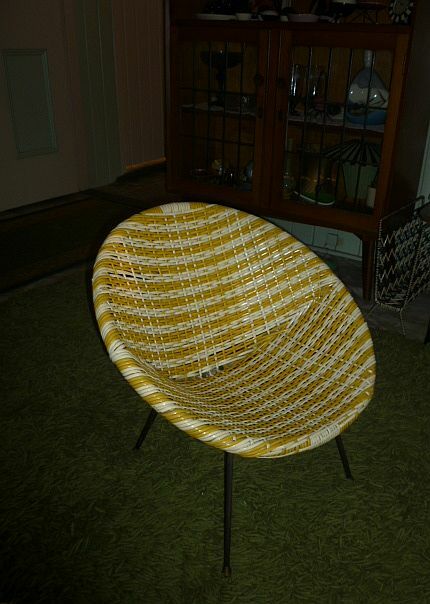 That peacock print is beautiful and you've already spotted that I have the black and white version of VB's yellow chair. Ahh, SUCH lovely things indeed! Favourites? 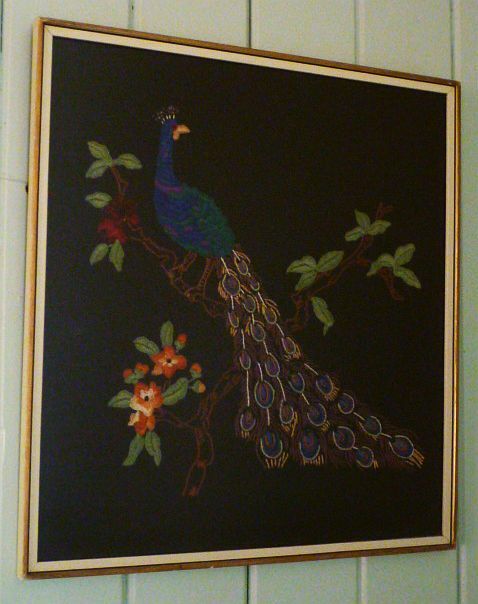 Definitely the light fitting, love the magazine rack, and adore the embroidered pictures, especially the peacock. 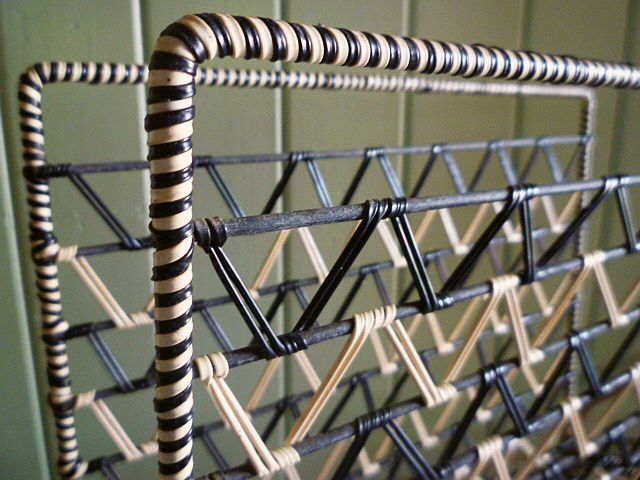 love the magazine rack best of all ! and the chair, Mum and Dad had 2 outside the kitchen door, grey and pink! oh if only they didnt go to the tip!!!! You have found some really nice stuff for yourself. The light fixture is gorgeous. 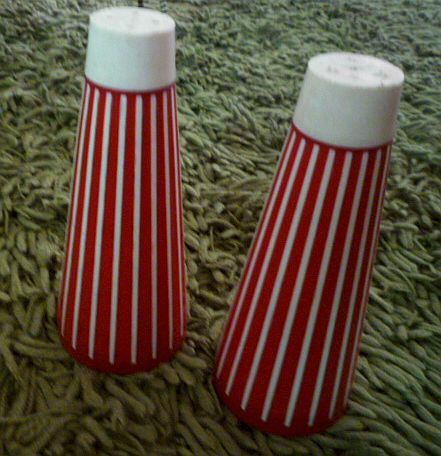 The red and white S & P shakers so cute! 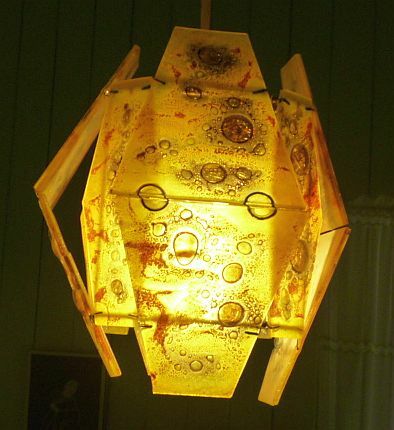 I love the atomic lamp and all your pictures. The coolie chair is awsome I bet VB loves it. Squee! That light fitting is my fave here!But everything is lovely and will be so wonderful to live with!! Super nice finds! Mom had a saucer chair, I've seen my grandma sitting in it back when she visited here (oooo a looong time ago! The late 50's). I've been keeping my eye out for unusual things like that swag lamp. I need a new hanging lamp for my living room. Oh man, the magazine rack and the table lamp are FABULOUS!